Punakaiki and the Wild West Coast - Home to More Than Just Pancakes! Punakaiki and the Wild West Coast – Home to More Than Just Pancakes! Home Travel Blogs New Zealand Punakaiki and the Wild West Coast – Home to More Than Just Pancakes! The West Coast of the South Island is a region which is radically underrated. For many travellers who visit the country on a tight time schedule, it often doesn’t make the bucket list. This is because more well-known regions such as Queenstown and Fiordland usually take priority in people’s itineraries. The West Coast tends to be less talked about as an area because it’s far less developed. It’s true that the sandflies can be a bit of a bother, but it’s well worth putting up with to explore this pristine region. 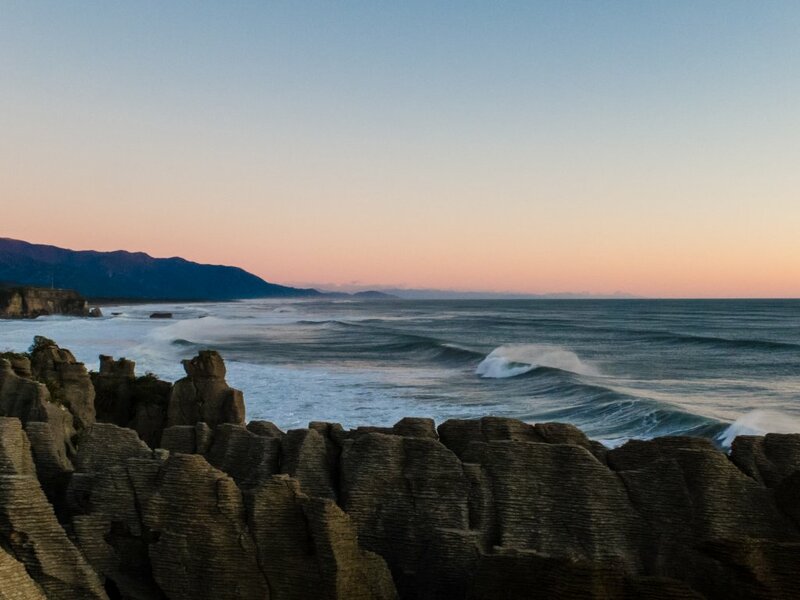 Punakaiki and the northern coast is an area which you shouldn’t miss out on! The village of Punakaiki is 45km north of Greymouth, the main town on the West Coast. It’s the gateway into Paparoa National Park, which is home to over 400 square kilometers of native forest, hiking trails and cave networks. It’s famous limestone cliffs are absolutely heaving with vegetation – this is truly a place that looks like it’s straight out of the Jurassic era! Opportunities to get into nature abound here, whether you are after a quick scroll or a multi-day tramp, and the wildlife is splendid. ‘Nature’s architecture’ is an apt description for the beautiful Pancake Rocks in Punakaiki. They’re probably the most photographed rock forms in New Zealand. The rocks are limestone, which has gradually worn away over millennia to form these magnificent columns. The clear layering you can see in the stone (where the ‘pancake’ moniker comes from) is due to the alternating layers of marine animals and plant sediments. Best of all, the rocks are home to several vertical blowholes that the sea shoots through when it’s high tide. Be careful, or you might get wet! Check the tide times. If you want to see the dramatic seaspray through the blowholes (and get some dramatic photos) you need to time your visit with the high tide. You can find this information at the Punakaiki cafe and many of the nearby campgrounds. Insect Repellant. This is especially important if you are visiting in the evening when the temperature starts to cool down. This is when the sandflies come out to play! To be extra safe, layer up with long pants and jumpers. As a destination, Punakaiki is not a drive-by with the kids in the back of the car with their Playstations! (Yes, this does happen with some of our visitors, can you believe it!) and it’s definitely not a one-nighter. However, this is what many travellers end up doing. Most will visit Punakaiki (and by this, we mean just the pancake rocks) in a quick stop en route down the coast towards Queenstown and Wanaka. For this reason, the wider Paparoa National Park area remains pretty unknown to most. They have no idea just how much they are missing out on! 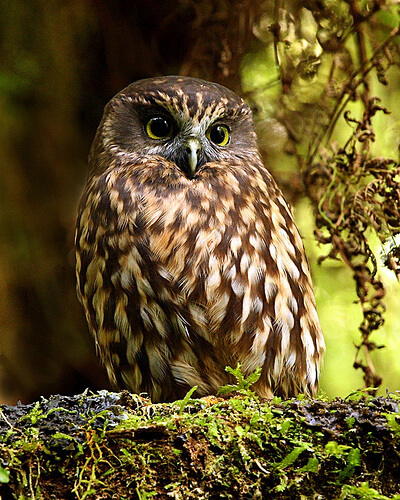 Amazing nature activities abound here, because there isn’t an ecosystem like it in the rest of New Zealand. So here’s what you do. On the first day, meander through the area to explore. Do the Pancake Rocks, settle in, take a few strolls in the park. Try kayaking if you want something a bit more energetic. 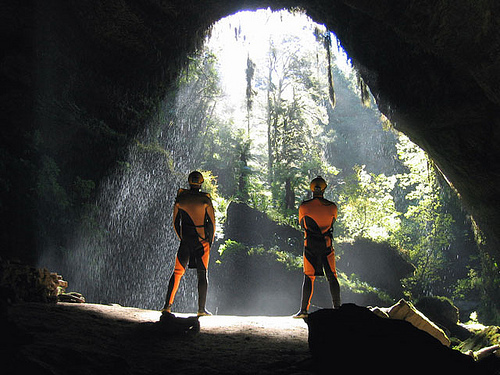 On the second day, take a trip to Charleston, which is an old gold mining area 30 minutes to the north of Punakaiki. This northern coastline is truly spectacular. You’ll notice that once you get past Punakaiki, the road traffic drops off very sharply. That’s because it’s pretty much the end of the line as far as most mainstream tourism goes! There is the turn-off just past here in the town of Westport for the inland route up to Nelson, but there is no sizable settlement until you reach the town of Karamea, which is home to the truly incredible Oparara Arches. I can’t recommend this area enough – try to make room for it if you can! Anyway, I digress. 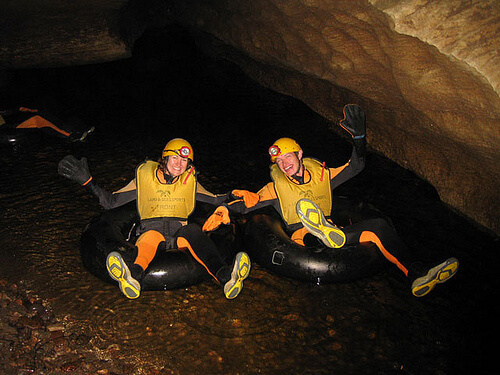 There are three main guided Gloworm Cave tours in New Zealand: Waitomo, Te Anau, and little ole Charleston! Out of the three, Charleston’s offering is the least well-known, but no less fantastic. Underwater Rafting is a must-do in this country. You’ll be kitted out with wetsuits and helmets. Then you just lie back in the rubber tubes and allow yourself to float leisurely through a slow-moving river, guided only by the natural light of hundreds of gloworms. Spectacular? That’s an understatement. It’s a 4-hour adventure that you won’t forget! So, where to stay? Punakaiki is not known for its fine dining, but for pure atmosphere, you can’t beat the Punakaiki Tavern. We prefer to stay in places that provide dinner on request. This comes in very handy when you’re tired after a day’s driving. 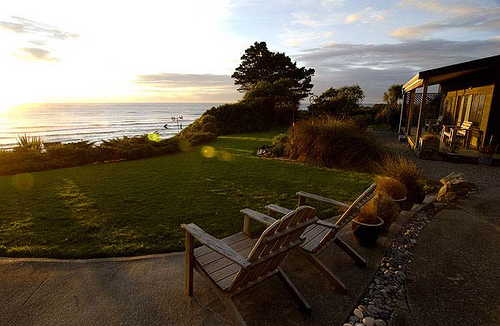 The Punakaiki Resort is another option. It’s in a great location, looking down on an unobstructed view of the beach and we like the echo rooms. On our most recent stay in Punakaiki, we chose a B & B experience at the Breakers Boutique Accommodation, which is a few kilometres away from Punakaiki village. We loved the Alfresco options of the Driftwood Room, which was away from the main lodge and private – the views are stunning. A few couples occasionally walked by but kept a respectable distance. (Most Kiwis are pretty unobtrusive and wouldn’t dream of overstepping certain boundaries, even if you looked like Brad Pitt and his missus!) The owners, Jan & Stephen, are also incredibly knowledgeable about the area. What they don’t know isn’t worth knowing! For our next stay for something even more privately located, we’ll be staying at The Rocks Homestay. This three-bedroomed lodge is perfect if you want the famous Nikau Palms and rainforest right up to your front door! In fact, Nikau Palms are everywhere in this area. The owners, Eva and Roland are Swiss and multilingual. Roland was an accountant in another life. That is until he found New Zealand and photography! His photos are stunners. Eva is also a gifted artist, and it seems these guys have got it all. They’re fabulous cooks, and with prior notice, they’ll cook up a delicious Mediterranean dinner! 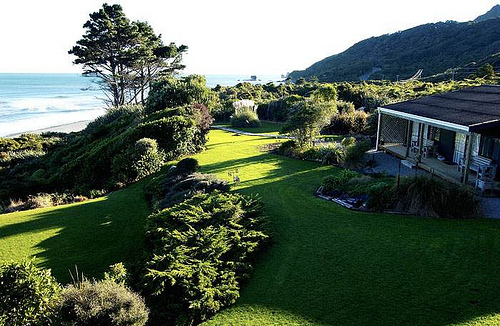 You won’t regret visiting this jewel of the South Island. Punakaiki has so much to offer that can’t be done in one day. It’s worth dedicating some time to this region to explore all its nooks and crannies.